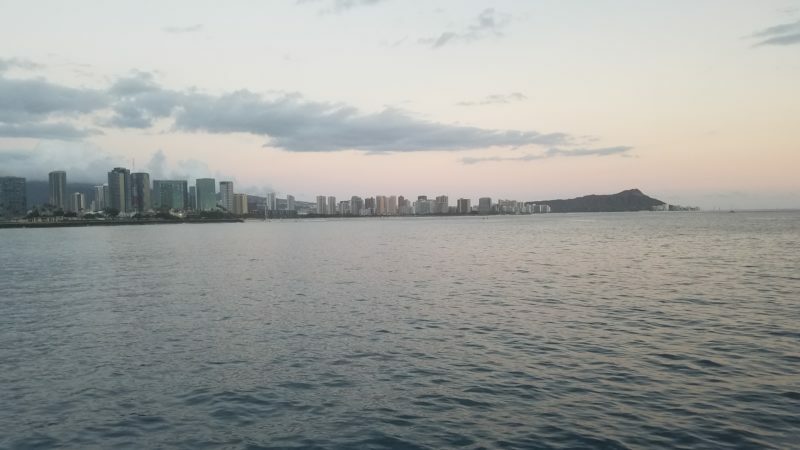 The Atlantis Majestic Dinner Cruise is wonderful way to spend an evening on the water in Waikiki. 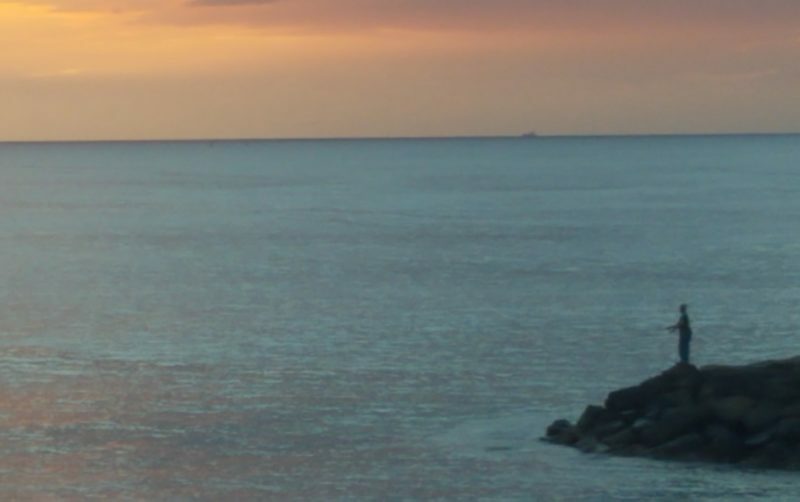 Enjoy great food and drinks while watching a stunning Hawaii sunset. Friday nights are particularly special, as the Majestic parks in the waters in front of the Hilton Hawaiian Village for a dazzling weekly fireworks show that lights up the skies over Waikiki. We arrived at the Majestic’s dock near Aloha Tower early, about 5pm on a Friday. After getting our picture taken, we boarded the Majestic and climbed to the observation deck, where appetizers and cocktails are served. There is also a full dinner cruise on offer one deck below, with Hawaii music and hula dancers. We were greeted by a host/server with a beaming Polynesian smile. We’d later learn that he plays football for the University of Hawaii Rainbow Warriors. The massive engines below deck murmured as the Majestic bobbed in its berth. The glass towers of Kakaako reflected the blues and grays of the sunset sky over West Oahu. Only a handful of people boarded with us, much to our surprise. Until, that is, a fleet of tour buses arrived. The buses disgorged dozens of tourists in gaudy cruise-wear who lined up to board. Their excitement was obvious. The Majestic set sail at 5:30pm, slowly chugging its way out of Honolulu Harbor and into the open waters off Honolulu. As the massive catamaran made its way east toward Diamond Head, a weekly yacht race was just getting underway. Several classes of sailboats, dozens of vessels, sped off into the distance as the sun went down. As dark fell, the illuminated Rainbow Tower at the Hilton gleamed as a thousand flashes popped along the entire Waikiki shoreline all the way to Diamond Head. The Atlantis Majestic sails toward Diamond Head at sunset. We were seated with two retired Australian couples who travel the world together. Forced company like that can sometimes be awkward. But as dulcet tones of traditional Hawaiian music wafted up from the dining cabin below and drinks began to flow, the friendly conversation came easy. We all laughed and applauded a comically poor group rendition of “Happy Birthday” for an unknown passenger. The appetizer buffet featured tasty chicken satay, Swedish meatballs, edamame (marinated soy beans), and a spicy andouille. The Appetizer Cruise also offers a robust signature cocktail menu, Hawaii-brewed beers, and a full selection of fine spirits. We were content to stay up on the observation deck. We assumed that the full dinner cruise menu was more sophisticated (and spendy). Friday night fireworks in Waikiki from the Atlantic Majestic. When the fireworks began at 7:45pm, the whole boat grew quiet except for the oohs-and-ahs of about 100 mystified passengers. The weekly fireworks show is spectacular from anywhere in Waikiki. But from beneath it, just a few hundred yards offshore, it’s breathtaking. Cameras were held aloft by dozens of passengers crowded on the Majestic’s bow as the 10-minute show streaked in the night sky. 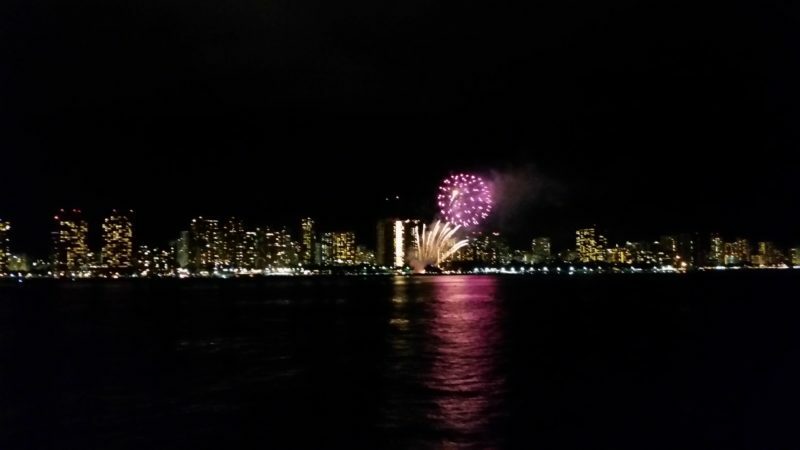 Almost immediately after the fireworks, the Majestic’s engines fired up and the big boat lumbered back west toward Honolulu Harbor and the twinkling downtown skyline. The Majestic swung into its berth a little after 8pm. We bid a fond farewell to our new Australian friends and assured our host, Nayt, that we’d be looking for his number when UH Football plays next. A lone fisherman at Honolulu Harbor as the Atlantis Majestic sets sail at sunset. I eavesdropped on our fellow passengers as we debarked. The prevailing sentiment seemed to be that everyone on the cruise was coming away with a feeling that they had just enjoyed something truly special and unique. Even this old kama’aina has to agree. 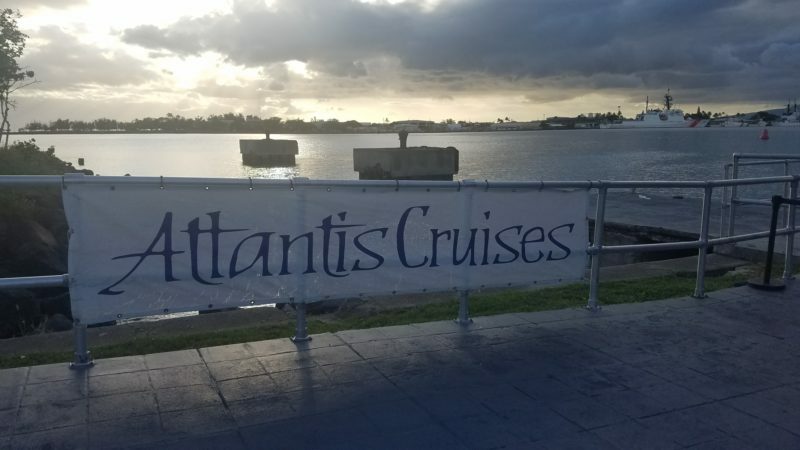 The Atlantis Majestic Dinner/Appetizer Cruise is a wonderful way for visitors and residents to enjoy an evening on the ocean under a mesmerizing sunset in paradise. The Friday cruise and fireworks show are especially highly recommended.